This will show you how you can load, save or clear a route. Once a route has been activated you will have the option on saving the route so you can access this route at anytime. You will be able to name the route to whatever you feel appropriate. The default saving suggestion is a preferred one to use. Let's go and have a look how we can save a route that has already been loaded in. 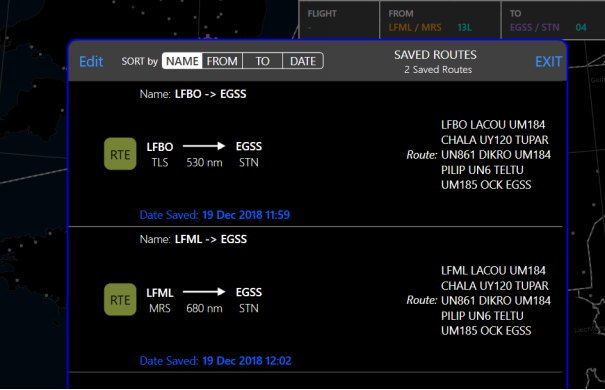 We have loaded a route from LFBO to EGKK already for you, let's have a look at how we can save this route by clicking on "Flight" in the toolbar. Click the Save menu item. To enable the “SAVE” button you need to make sure that you have enabled Save routes in the general setting, see Settings for instructions. 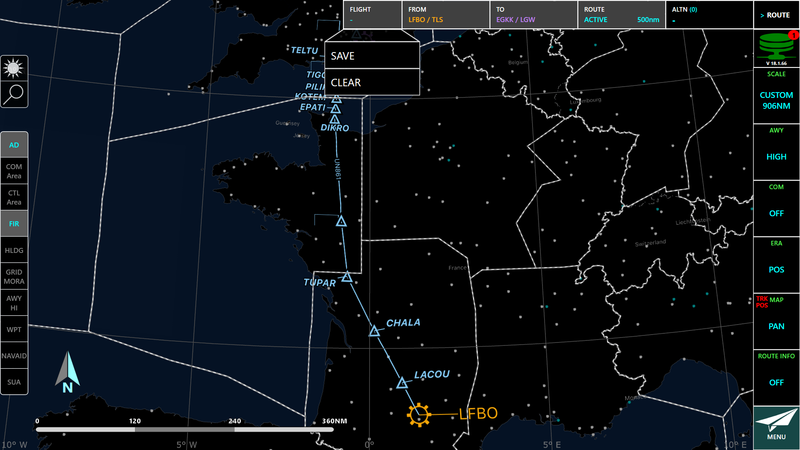 A FROM and TO aerodromes with a validated route must be activated for the option of saving. By default it will give you a route name to use, FROM - > TO (ALT1, ALT2). 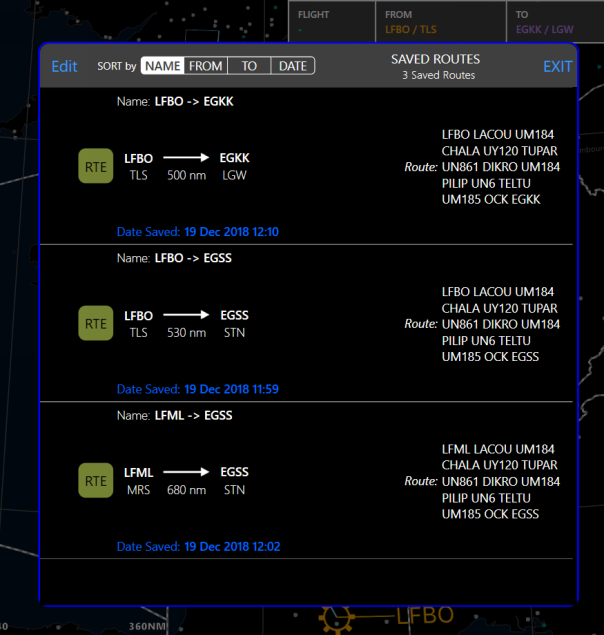 You can change the name just by clicking in the search bar and typing your new route name. Let's leave the route name for now. Once you have saved the route you will be taken back to the map screen. Let's go and have a look at your recently saved route. 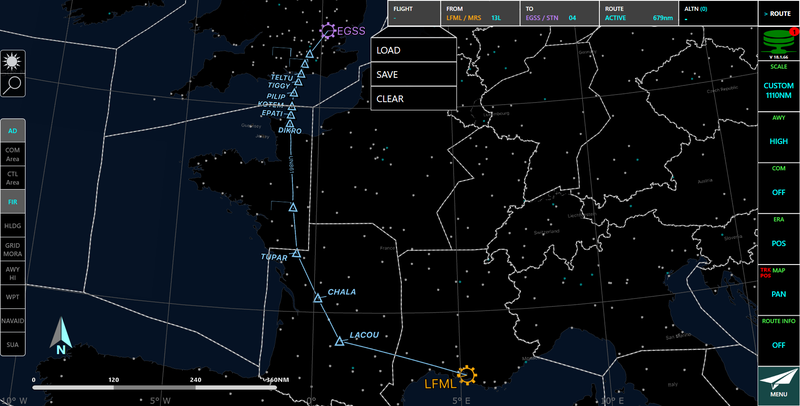 The Load option is now available, this shows us that we have some saved routes in the application. Click the Load menu item. The following window will appear once you access the load function. 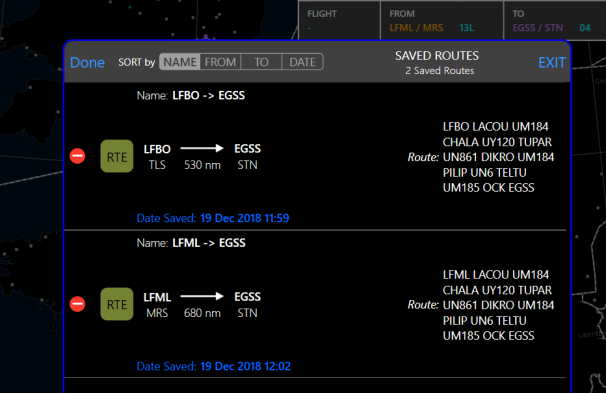 You can see that the route we saved has been listed. Click the RTE (Route) button. Your route will be listed here for you to view. Routes will be explained in more details in a later topic. 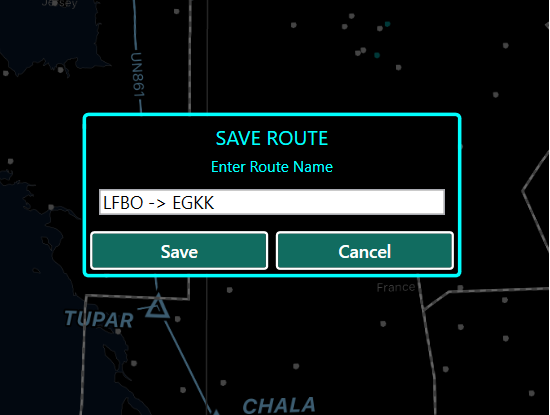 You can sort the list of saved routes by clicking on any of the following tabs. 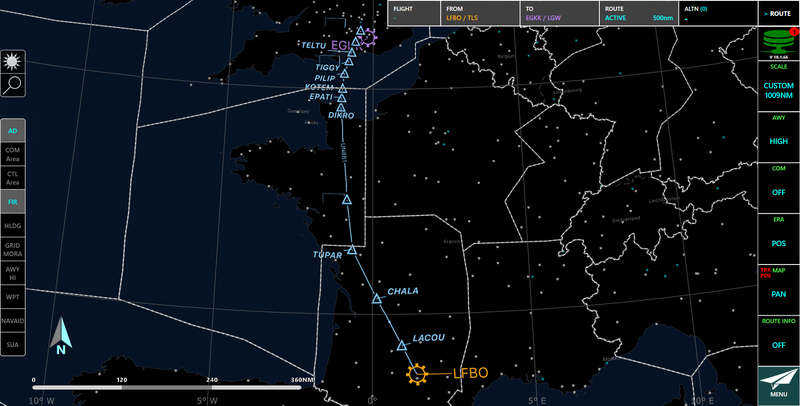 Let's have a look at loading this route. Before you can load a route your present data will be erased if you have not already saved it. Your new route is now loaded and ready for you to use. You can go back and load any other route just going back to "Flight". Let's have a look how we can now remove a saved route that we don't use anymore. The clear button will not permanently remove a route it will only remove it from the route toolbar, you will need to go into the list of routes to delete them. Click on the load button. Simply find the route you want to delete and click the following button . 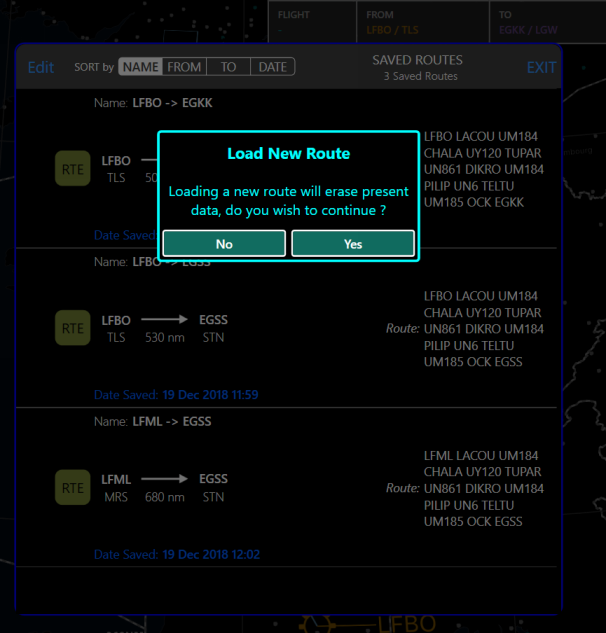 This will bring up an option to permanently delete the route. You will now notice that the route has been removed. Click done to complete the process. This will send you back to the enroute map.